Throughout most of history, both men and women used handbags for practical purposes. Pockets were unknown in medieval clothing, therefore purses and pouches of various kinds were widely utilized by all people of all classes. The working class, artisans, pilgrims, and peasants used what we would call handbags. The common mode of travel during medieval times was by foot and bags offered a convenient way to carry small goods from place to place. 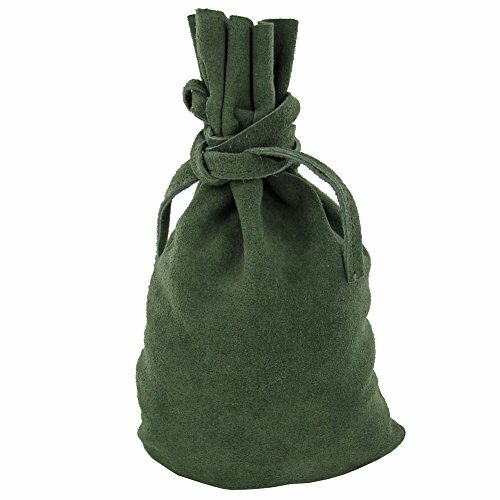 In a bag like the Renaissance Drawstring Master Artisan Suede Bag food, tools, clothing, and smaller items like flint would have been carried. The Master Artisan is constructed of vivid green suede with a drawstring closure. The long string allows you to easily tie this parcel to your person or horse. Use this bag for everyday use or re-enactments.